Everyone who knows me, knows that I love Champagne so MUCH (especially Dom Perignon) and that I should be next in line for Kyla's title, well not quite - but almost (after Kylie). Since being pregnant I haven't craved it but I have missed the flavours and the exciting sound of 'popping' a bottle! My husband has assured me though - that he will put our 2004, Grand Vintage Moët in the fridge, ready to 'pop' once I DO (mid Jan) what a good man - a long with a seafood platter (of course!). I was lucky enough to interview her, I mixed some fashionable questions with some bubbly questions as I really do love her impeccable style. I'm really keen to try the champagne that may surprise many of us! KK: Classic with a twist! I try not to wear black and I don’t like to shop at mainstream clothing sites or stores, as I like clothes with an edge or difference. You will often see me in something with colour, which is a little bit edgy or unique. JW: How did you know you were the Champagne Dame? 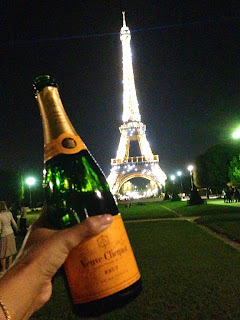 KK: When I first left Australia bound for Paris in 2005 after falling in love with the story of Champagne I knew. 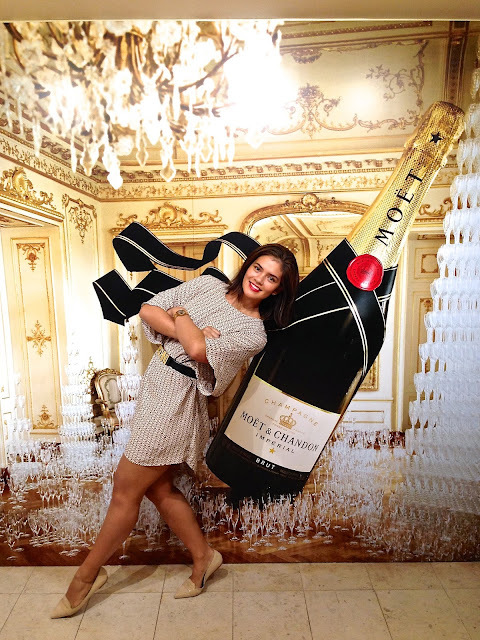 In the beginning of my career I worked for Louis Vuitton Moët Hennessy but I still embodied my ‘Dame-ness’. I walked, talked and lived Champagne. The minute I landed in Champagne I assumed the persona of a Champagne Dame. I completely changed my life leaving my corporate job and former existence behind. JW: What is your most fave champagne ever? KK: I love many types of champagne, but Dom Ruinart Vintage 2002 is one of my favourite wines. One hundred percent Chardonnay, Burgundian in nature and ethereal – this champagne is a showstopper. JW: What champagne surprises you (price wise)? KK: Alfred Gratien. It’s a small house—which uses oak like Bollinger—but without the price tag. It’s gorgeous. KK: I am in a five star hotel and the service being delivered is equivalent to what the Queen would receive. I was in Paris for a photo shoot recently and I stayed in the Penthouse of the La Reserve Hotel. I was treated like royalty. It was absolutely divine, the hotel staff were faultless and the room was incredible complete with fluffy robes, champagne everyday on my bedside table and fresh strawberries in my bathroom. JW: The perfect tip to prepare for drinking champagne? KK: Put a smile on your dial and let go of the world. Champagne is one of the most complicated wines in the world to make. It comes from one of the most climatically challenging regions in the world and takes literally years to age the perfect bottle. Stop, relax and take every sip slowly. Enjoy champagne mindfully and appreciate the hard work of the winemaker and the virtues of mother nature, which have come together to create this magic drop. KK: I have an AESOP body balm with pink grape fruit for my hands, a Vitamin C serum from Keihl’s for my face and lipsticks – lots of lipsticks. I absolutely never leave home without lipstick on. I have a NARS Hot Pink, a Revlon Love That Red, Run Way Room CEO and a L’Oreal Scarlet Silhouette. KK: I wanted to be the speaker in Parliament when I was a little girl. I was fascinated by business and politics from a very young age. I had a curious mind since I was knee high to a grasshopper and was quite righteous and quite determined despite growing up in a fairly small country town. I guess I always wanted to rule the roost and run my own race but it just took me a while to figure out my passion was Champagne! It’s been over a decade now that I have devoted my life to Champagne – I can’t see that changing. With the launch of Emperor, my new online retail store specialising in Champagne, my journey is only just beginning.